HANDLANDY is a professional manufacturer with more than 10 year's experience in the gloves industry. We specialize in high-quality, durable work gloves for many professions including drivers, plumber, landscapers, masonry workers, electricians and construction workers and so on. We develops and sells advanced-technology, task-specific safety gloves for applications that demand extreme reliability. Help each worker get the job done more safety, efficiently ans effectively. These Industries include drilling & production, manufacturing, construction & engineering, mining, utilities and public safety. TPR Impact Protection: Thermo Plastic Rubber (TPR) knuckle guards and full-length fingertip protection reduce the risk of impact and pinching injuries. Easy On. Easy Off : Heavy utility gloves with secure wrist closure provides a secure fit to your wrist that allows for easy glove removal between tasks. Breathable Knitting Mesh: Anti vibration gloves with modern sporty spandex for breathable comfort and proper stretch for flexibility and performance. This heavy impact Mechanic Work Gloves Fit for multi-uses: drilling, mowing the lawn, running the chains saw, power tools, and so on. 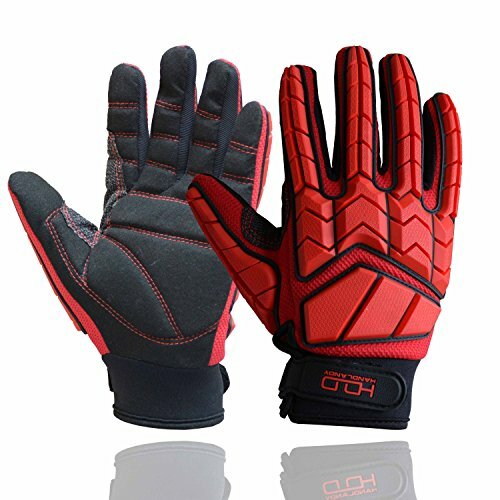 Synthetic palm with 5mm SBR inner padded patch on each fingers and palm, help alleviate the vibration from the machines, perfir for mowing lawn, power tools, running chainsaw. Secure Wrist Closure: Adjustable wrist strap provides a secure fit to your wrist that allows for easy glove removal between tasks.